At Oasis we can help you cleanse, tone, correct and protect your skin. We have a full spectrum of skin care facials ranging from our signature Calming Facial to our Pumpkin Retexturizing Facial for both men and women. We also carry leading skin care lines to include Skin Ceuticals, ELTA, BioPelle and more. For the month of August, we are offering special discounts on facials ranging from 10% - 20%, depending on how much you spend with us. Spend $50 to $150 and receive 10%off Spend $151 to $350 and receive 15%off Spend $351 or more and receive 20% off Our Esthetician, Nicole Ortega, is incredibly well-trained and personable. Nicole graduated from the New Mexico Aveda Institute in December of 2001 in Esthiology and has a wide range of knowledge in the field. 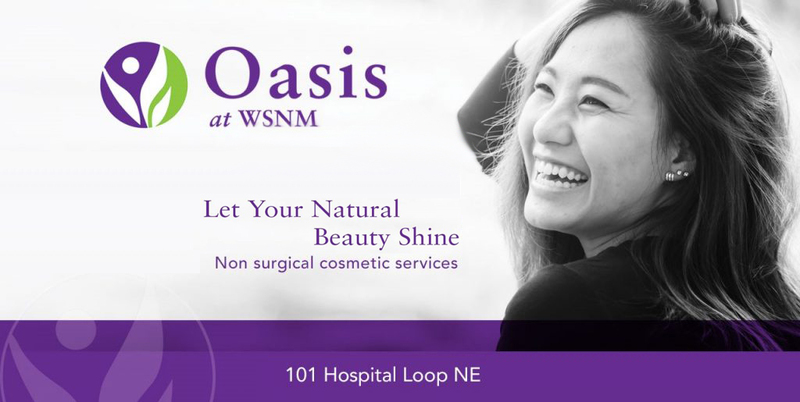 At Oasis we provide clinically proven cosmetic services and take the time to understand patient goals and health concerns as we recommend treatment plans and products. I think this makes us different from other cosmetic spas and invite you to visit us at the Oasis Med Spa. Call (505) 344-1444 to schedule your appointment today.